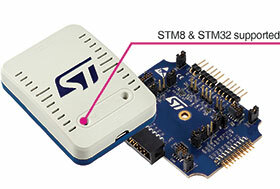 STMicroelectronics has introduced the next-generation STLINK-V3 probe for programming and debugging STM8 and STM32 microcontrollers, adding enhancements to further increase flexibility and efficiency. Now featuring mass-storage support, a virtual COM port with multipath bridge, and three-times faster write performance, the competitively priced STLINK-V3 saves development time and easily reprograms devices in the field. In addition to providing typical JTAG/Serial-Wire Debug (SWD) and Single-Wire Interface Module (SWIM) connections, STLINK-V3’s virtual COM port and multipath bridge allow communication through the microcontroller UART, I²C, SPI or CAN interface, or GPIOs. This lets developers conveniently automate tests using custom control commands and observe run-time data on the host PC, or use the STLINK-V3 to program devices with a bootloader and simplify product maintenance. Major development tools already support STLINK-V3, allowing users to take advantage of the powerful features from within a convenient graphical environment such as the STM32Cube programmer and integrated development environments (IDE) such as Keil MDK-ARM, IAR EWARM, and GCC-based IDEs. ST also allows free access to STLINK-V3 low-level APIs, to facilitate integration with custom or automated test platforms. Supplied as a complete kit, the STLINK-V3SET contains the probe, debug connector, cables and an adaptor board that supports SWIM-specific features and provides access to signals from the multipath bridge. Users can further expand functionality cost-effectively with additional boards such as a voltage-translator module.